Sofia Coppola films are amongst my favorite. I have read Virgin Suicides and considered her film better than Eugenides's book, a rare feat for a film-maker. I often refer to Lost in Translation and have watched Marie-Antoinette a dozen times with my children. We are history buffs and my children got acquainted with Versailles and its drama much earlier than I ever did. Louis XIV, le Roi Soleil, may be first or second, depending on where you rank Napoleon as the most famous French man in history. He is followed by the unlucky decapitated Louis XVI, the husband of Marie-Antoinette, the biscuit affecionado, who helps LaDuree sell its delicious macarons. 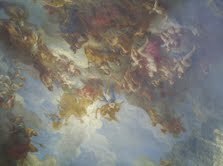 This will be my third trip to Versailles, the most tastefully guilded palace in the world. My childhood visit permitted me to put history in its context, my second visit, last summer with my children, allowed me to make concrete my art history classes. This third visit will confirm, if I may be boastful, my art flair. 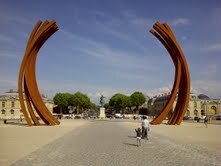 You may say that discovering Bernar Venet was an obvious act. How could anybody walk by these monumental arcs and not react? I have always admired their simple lines. France has now paid homage to this talented contemporary sculptor by inviting him to add beauty to Versailles. Versailles the classical with its intricately lined symmetrical gardens designed by LeNotre. 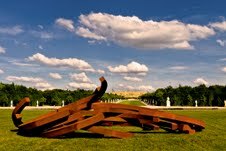 Some may say that the sculptures contrast in their rust-colored modern steel arcs, but that it is the desired effect, and it makes for the beauty of the exhibit. What I came to discover when I approached the wonderous sculptures that were spread in the gardens, was the harmonious fit of contemporary French art placed with reverence and in perfect harmony with the majestic environment. As if the sculptor had taken a pair of compasses and added arcs to the straight lines of LeNotre's master plan, as an added geometric assignment, and to finish it off, a signature, an indefinite line, squiggled by the side of the palace. I guess the most famous Frenchman today is DSK who is sweating it out in a $50,000 a month town house in NYC after his foolish episode.The second most narcist of them all is BHL who donned his Napoleon hat and went to Misrata to claim the Libyan revolution as his brainchild. When it comes to the creative BV,who I had the pleasure of meeting once last summer,he is an example of true French creativity and genius. The French have a long royal lineage. What differentiates the French royals is their patronage of the arts,upheld by The French Republic.